U.S. Sens. Mark Warner (D-Va.) and Ben Cardin and Barbara Mikulski (both D-Md.) spoke out today about the harm the shutdown of the federal government is doing to federal workers and their families nationwide, as well as our overall economy. The senators were joined today by four furloughed federal workers who shared their own stories of how the shutdown is impacting them. “We’re putting the important work of the federal government on hold, and causing economic harm to federal employees and their families, because a narrow group in the House will not allow the Speaker to bring up legislation to reopen the government. That’s not right, and it’s not fair. 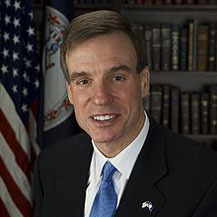 This is a self-inflicted wound to our economy,” said Warner. Marcelo Del Canto. He is an eight-year veteran of the Substance Abuse and Mental Health Services Administration (SAMHSA) in Rockville. He and his wife are among the 90 percent of SAMHSA employees who have been furloughed. They have lost not one but two incomes soon after they bought a house in Poolesville, MD. As a budget analyst, this shutdown was not something they could plan for in their family budget. Amy Fritz, a meteorologist and physical oceanographer at the National Weather Service in Silver Spring, MD. Amy has multiple post-graduate degrees and $130,000 in student loans to juggle while out of work on furlough. She is proud to be a civil servant and just wants to get back to work. Carter Kimsey, a grants administrator at the National Science Foundation in Arlington, VA. She has worked for NSF since 1976. She has had to put off major purchases due to the loss of income but worries more about the students and young scientists doing research overseas who have no ability to pay tuition, rent, food, and other living expenses. She has a stack of grant applications that she had to leave on her desk when she was furloughed. Steve Hopkins. A federal employee for 25 years, he works for the Environmental Protection Agency’s Office of Pesticide Programs in Northern Virginia. He works on collaborative partnerships between EPA, federal agencies, and private entities to reduce the need for pesticides. He just wants to do his job and to be able to do it well. Furloughs due to the shutdown come soon after he and his colleagues had to endure six days of furloughs due to sequestration.